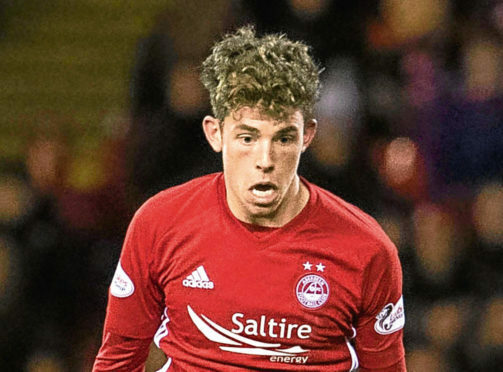 Ryan Christie, Stevie May and a Greg Stewart double fired Aberdeen to victory against St Johntone as the Dons moved level with Rangers in the race for second place in the Scottish Premiership. A 4-1 victory for the Dons means only goal difference separates Derek McInnes’ side and Rangers and Aberdeen have the chance to move clear in second place when they play their game in hand against Motherwell on Tuesday. Joe Lewis returned to the starting line-up for the Dons following his recovery from a knee injury sustained at Ibrox in January. Gary Mackay-Steven and Greg Stewart also returned to the starting 11 in place of the injured Niall McGinn and Chidi Nwakali. Goalkeeper Freddie Woodman dropped to the bench. For St Johnstone, manager Tommy Wright made three changes from the side which beat Hamilton in midweek with Chris Millar, Denny Johnstone and David Wotherspoon coming into the starting line-up. The Dons made the breakthrough just after the half hour mark when Mackay-Steven’s header sent Christie clear from the halfway line and the on-loan Celtic midfielder took the ball around Alan Mannus before firing into the net despite the efforts of two Saints defenders on the line. May headed a Graeme Shinnie cross against the crossbar as the home side pushed for a second but May was not to be denied a goal against his former club and he beat the Saints goalkeeper after Christie’s through ball had sent him clear inside the box. The Dons put the game beyond Saints five minutes into the second half when Stewart got the final touch to make sure Shay Logan’s header crossed the line. Saints pulled a goal back through Matty Willock when he headed Liam Craig’s cross past Lewis but the comeback was shortlived as Stewart fired home his second and his side’s fourth nine minutes from time.